In the preseason finale Thursday almost all the starters opened the game on offense and defense. There were however a couple of missing pieces from the lineups on each side of the ball. The offense was missing their starting tight end and left guard. The defense was missing their starting cornerback opposite Leodis McKelvin. Here’s why. Scott Chandler was reported by the team to have a knee injury. Meanwhile Stephon Gilmore was reported to have a groin injury. The severity of each injury is not known and it’s presumed that both injuries were sustained in practice during the week. Rookie LB Randell Johnson also suffered an ankle injury. He was a game time decision Thursday and tested it pre-game, but could not go. WR T.J. Graham also came out of the game with an ankle injury. Coming back from offseason hip surgery has been a long and arduous process for T.J. Graham, but over the past week or so he’s demonstrated progress on both offense and on special teams. Still, it’s nowhere near where Graham believes his peak resides so he’s hoping to get there sooner rather than later. Graham performed well on punt returns Saturday night in Pittsburgh averaging a respectable nine yards a return with a long of 23 yards. Any average that approaches the equivalent of an extra first down for the offense (10 yards) is considered pretty solid. Graham was also targeted three times in the game and had one catch for 16 yards. His past week he’s been a bigger factor in the passing game. The third-year wideout pulled no punches when it came time to assess his performance thus far in training camp. The N.C. State product is hopeful that there are enough opportunities left to make a full return to his optimum form. Two weeks of OTAs are in the books with a week to go beginning this coming Monday. As always we’ll have full coverage here on Buffalobills.com. Here now are your latest questions from email at AskChris@bills.nfl.net and on Twitter @ChrisBrownBills. I liked what Bills did in rounds 1,2,3 however they did not address DE. Manny Lawson has never played end and Wynn is a bubble player at most. Hughes is more of a situational pass rusher. I’m a bit concerned what they are doing. Since they won’t blitz as much the DE’s are more important under Schwartz. This puts more pressure on young DB’s as well. What do you think the future is at DE for 2014? CB: I don’t know that you can assume that this defense under Schwartz won’t blitz as much. From what I’ve witnessed in OTAs with the blitz packages going in there are an array of packages that Schwartz has in his playbook. How often he uses them remains to be seen. Lawson and Hughes will likely split the right defensive end role with Lawson in on more obvious run downs and Hughes on passing downs. What you might need to consider is how often Schwartz’s defenses in the past have put an opponent in a situation where blitzing is not necessary. Knowing that Schwartz’s Detroit defense last season finished first in the league in third down conversion percentage allowed (30.3%) and were second in the league in red zone defense (Bills were 14th and 6th) I’m going to give Buffalo’s defensive coordinator the benefit of the doubt that he’ll know when to blitz and how often to do so. I’m a long time Clemson fan and enjoyed watching C.J. Spiller returning kicks. He is one of the best I have ever seen at it and I billeve he could challenge Devin Hesters records. With the need at special teams, Do you think the Bills should try C.J. returning kickoffs? He does hold the FBS record for kickoff return touchdowns with 7. CB: It’s funny that you bring this up. As I wrote in our OTA practice notes column earlier this week C.J. Spiller was one of the kick returners in practice along with T.J. Graham and Leodis McKelvin. Spiller hasn’t returned a kick for the Bills since 2011, but it looks as though he’s at least being considered for the 2014 season. That being said I wouldn’t get excited about this possibly happening until we see it in a preseason game. With the new additions at cornerback, and a new defensive coordinator, it almost seems like Nickell Robey has been getting lost in the mix, after a productive rookie campaign. I’ve been wondering, has their been any talk about trying him out at safety as a possible replacement for Byrd? Between his solid tackling and his playmaking ability, I think he could transition well into the role, which would also serve to reduce his height concerns. Jim Leonhard has had a decent career at FS for a shorter defensive back. I would be very interested to hear your thoughts on the subject. CB: I don’t think you have anything to worry about with Nickell Robey. First, Robey has looked solid in his nickel corner role. Yes, he will have competition, chiefly in the form of Corey Graham, but knowing how much New England goes four wide as well as other opponents on Buffalo’s roster like Denver, Detroit, Kansas City and Green Bay chances are Buffalo will need to make use of both of those slot defenders. To help you breathe easier about Robey’s role on this team I’ll refer you to a recent quote by defensive coordinator Jim Schwartz on Robey. Thank you for all you do. Let me start by saying I’m extremely happy with our draft this year! My question is regarding our depth at the receiver position. I think it may be difficult for a guy like TJ Graham to make it on the field. Another guy I like is Marcus Easley. I know Easley helped out, and excelled on special teams last year. Do you think that they might keep a guy like TJ, and utilize his speed on special teams? If not I’m afraid I don’t think he’ll make the roster. I look forward to hearing your opinion! CB: I do think T.J. is in for an uphill battle due mainly to the fact that additions like Sammy Watkins and Mike Williams are automatically ahead of him on the depth chart. Robert Woods and Marquise Goodwin were draft choices deemed as fits by this coaching staff. Graham was inherited. Add in the fact that the staff likes Kevin Elliott, who could carve out a role on special teams as well and both Graham and Easley will be battling for one of the final spots on Buffalo’s roster with players like Elliott and Chris Hogan, both of whom have shown well thus far in OTAs. With the trade of Stevie Johnson to the 49ers do they Bills have any financial obligations remaining from his contract? CB: The figure I have is $10.225M in dead money, which the Bills can spread over the next three seasons, which is the length that Johnson’s contract ran. With the addition of Sammy Watkins to Buffalo’s offense there is another player with sub 4.5 speed on the field. As the Bills rookie receiver sees it there is speed to burn on the Bills attack. Adding Watkins speed to that of Marquise Goodwin (4.27) and T.J. Graham (4.41) in particular gives Buffalo three wideouts with sub 4.45 speed. Add in C.J. Spiller’s 4.3 speed and it’s a lightning quick offense. 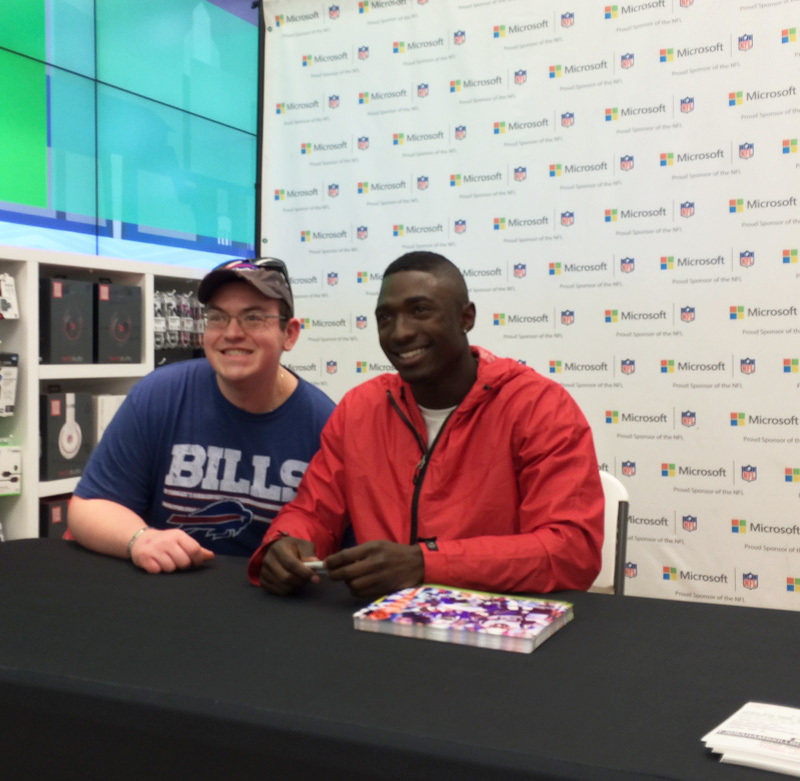 Over 100 Bills fans showed up to meet T.J. and check out the new game before it’s released in December 2014. For more info on the game, click here. As head coach Doug Marrone tries to move Buffalo’s offense forward he’s also trying to develop some of his deep passing threats into more than just field stretchers. I think that we have to find ways as an offense where we can get them t just be throwing go routes. When you look at two weeks ago when we played, we had and I went back and looked, we have targeted both of them. Four times for the two and then we target T.J. last week some t get the catches. Marrone said earlier this week that Goodwin’s route running ability is far more varied than go routes in terms of his ability. He wants to see him become a more varied component in Buffalo’s attack. It’s been talked about, but now it sounds like it will in fact come to fruition. Marquise Goodwin, who has delivered some of the team’s bigger pass plays of the season, will be seeing more playing time. That according to head coach Doug Marrone, who admits the deep threat has to see more time on the field. Marrone was asked about both Goodwin and T.J. Graham and their lack of involvement in the offense of late. “I think that those two guys are obviously guys that have great speed. We have to find a way to get them involved,” said Marrone. “Marquise Goodwin can run intermediate routes. T.J. Graham can run cross field routes so there are ways that we can get them involved, so we have to make sure we look at it. Marrone then followed up later by saying he intended to meet with offensive coordinator Nathaniel Hackett to discuss giving more time on the field to Goodwin specifically. Goodwin played 26 of the team’s 67 snaps on offense or 39 percent of the plays. It’s the final quarter of the 2013 regular season. Buffalo will try to post a winning record in these last four games, three of which are on the road. Here’s your latest edition of queries on email at AskChris@bills.nfl.net and on Twitter @ChrisBrownBills. Thank you for all your coverage of the Bills for us fans! I have two questions for you. First of all, it seems as though as of late the Bills offense has been pretty successful on the deep Go routes from TJ Graham and Marquise Goodwin. Do you think that Coach Marrone and Hackett would consider getting Spiller more involved in some deep plays in the passing game? Last year it seemed to work pretty well and it would give another added dimension to the offense given his speed and talent in the open field. My second question is, so far we have not seen many “trick” plays like fake field goals, fake Punts, flea flickers etc. Do you feel that this coaching staff just doesn’t feel comfortable running those plays, or is it just the fact that the situation to use a trick play just hasn’t come up yet? CB: I think the Bills will continue to work on pushing the ball down the field to take advantage of the speed that T.J. Graham and Marquise Goodwin bring to the offense. Those plays have been successful at times, but we all need to realize that those are not high percentage plays. Any coach will tell you the NFL is more about getting first downs than touchdowns, because the better an offense is at getting first downs, the more successful they are at scoring touchdowns. The offensive staff has made a concerted effort to go with high percentage plays in an effort to keep the offense on the field. As for trick plays, I think we will see a few before the season is over, but again the coaching staff is trying to build a foundation on consistent plays that are productive. There is a time and place for trick plays, but they are not something that any coach wants to hang his hat on. First off, thanks for doing an awesome job covering all the Bills News. My question for you is in regards to the Bills Defense. I feel that Jim Leonhard really played well, especially with his takeaways while he was filling in during injuries. Why don’t the Bills sub him in on obvious passing downs? I think he could be a strong player in the backfield and result in more turnovers for the Bills D.
Secondly, do you feel that Nickell Robey has the intangibles to eventually be considered to play a boundary corner as well as nickel? He seems to be excelling and really playing good football and seems to just keep getting better every week. CB: There’s no question that Leonard’s playing time on defense has suffered since Jairus Byrd and Stephon Gilmore returned to the lineup. Gilmore’s return allowed Aaron Williams to return to safety with Byrd manning the other safety spot. I like Leonhard as a player, and he is a heady player when it comes to anticipating and making big plays (INTs). That being said, Byrd and Williams offer better coverage ability by virtue of both of them being former cornerbacks. Byrd was a corner in college and Williams was a corner in college and his first two season in the NFL. That provides DC Mike Pettine with a lot of versatility in coverage assignments in his defensive scheme and as Pettine himself has said the strength of his defense is its versatility. That’s not to say that Leonhard, if needed, could not be a productive player in this defense. He’s proven that already this season. But Byrd and Williams offer more versatility and that helps to keep opposing offenses off guard. As for Nickell Robey, he has done very well as the team’s nickel corner. At 5’8” and 165 pounds that’s his position. He would be hard pressed to be as successful on the boundary as a cornerback. The receivers on the outside in this league are just too big and too physical. Robey based on his body type alone, would be a target out there for fade passes and jump balls. His best fit is as a slot defender and he can play for a long time in this league in that role. EJ’s decision making, release time and downfield accuracy appears to have room for improvement. This may be explained by his lack of NFL experience. Since there is no QB coach in the organization and Offensive coordinator Hackett’s collegiate playing experience is defensive orientated, how is EJ be coached up in a professional manner? CB: I understand your point about Hackett’s playing experience, but he has been working at the elbow of a host of offensive coaches at the position since he was a kid. He knows how to school quarterbacks on footwork and throwing technique. Decision making is something that should improve the more he plays and gets accustomed to defensive looks. I’ve wondered about how challenging it has been for Hackett to balance the responsibility of getting an offensive scheme implemented and executed effectively in year one while also helping a rookie quarterback make strides in his first year in the league. That’s a big ask. Add in the fact that he had to get a second rookie QB and another young signal caller ready to play at different points in the season and you see the demands that were placed on Hackett this season. What is the status of Carrington? He was playing great before he got hurt. Hope he is doing well. CB: Alex Carrington had successful surgery on his torn quadriceps tendon that landed him on injured reserve. I talked to him a couple of weeks ago and he told me he’s progressing well in his rehab. He’s working here at One Bills Drive on a daily basis with the trainers on his rehab regimen. The rehab timetable is typically 7-9 months and he’s just 11 weeks removed from suffering the injury, so he’s got a long road in front of him, but he’s walking under his own power. Something that I noticed during the Falcons game about EJ. Do you remember back in the day when Dan Marino would get behind center? He would always lick his hands and you knew was going to be a pass. CB: To clear this up for everyone. I saw that it was a popular topic on Twitter during the game last week, but there was no merit to it. There were run plays executed during the game when his mouthpiece was tucked into his helmet facemask instead of his mouth. There is no absolute situation in terms of play calls when it comes to the location of EJ Manuel’s mouthpiece. It may come as a bit of a surprise, but Marquise Goodwin does not lead the team in big pass plays this season. It’s due mainly to the fact that he missed four games with a broken hand. As we covered on Buffalobills.com today however, he is a developing weapon for the offense. Here’s a breakdown of the top big play receiving targets of the Bills this season, and it clearly favors those who have been able to stay in the lineup. Big pass plays are considered any pass play that covers 20 yards or more. Here’s how the big play receiving targets rank through 11 games this season. There are three other players with one big pass play this season. Lee Smith (28 yards), C.J. Spiller (27 yards) and Frank Summers (34 yards). The player with the greatest number of the team’s longest plays is not surprisingly Goodwin. Three of his four big plays have covered 40 yards or more and all went for touchdowns. Graham is second with two 40-plus yard plays. “Anytime we can get the ball down the field even when it’s windy like last week and make deep plays, it’s pretty good,” said Graham. Bills WR Stevie Johnson was wide open in the end zone on the failed 3rd-and-goal pass play to T.J. Graham because the man assigned to cover Johnson was not in position to cover Buffalo’s top receiver. As Johnson explains it Smith being the right place at the right time was none of Smith’s doing. Johnson describes why Smith was where he was when Jeff Tuel tried to hit Graham on the slant. “I shook him, he almost fell and he basically fell into an interception and that was it,” said Johnson. Johnson did not have a problem with Tuel going to Graham on that pass play. Tuel for the record did accept 100 percent responsibility for the outcome of the play. It wasn’t a perfect game on offense by any means. Yards were hard to come by on first and second down, but Buffalo was a respectable 9-for-19 on third downs for a conversion rate of 47 percent. That’s almost 15 percent above their season average (33.3%). Here’s why there success rate was higher Sunday. Part of the reason was Buffalo’s ability to convert on some third and longs in the game. In fact four of Buffalo’s nine third down conversions were third and longs. Bills center Eric Wood gave a ton of credit to QB Thad Lewis. Lewis hit Fred Jackson early and he converted a 3rd-and-15 with a 21-yard catch and run on the team’s first series. T.J. Graham converted a 3rd-and-17 with a 30-yard catch in the second quarter from Lewis. Stevie Johnson converted a 3rd-and-7 with a seven-yard catch, then followed up with a conversion of a 3rd-and-11 with an impressive spin move to elude a would be tackler to gain the extra necessary yards to move the sticks. Scott Chandler converted a 3rd-and-9 with a 12-yard catch. Though it was only a 3rd-and-medium situation, Fred Jackson had the biggest third down conversion of the game when he ripped a run off right tackle on 3rd-and-4 for 10 yards with 2:37 left in the game. Nevertheless seeing the Bills overcome long down and distance instead of the opposition was a welcome change. The second big division game in three weeks coming up on Sunday. Don’t forget the 4:25 pm start this week. Here are some of the more popular questions from you the fans this week. 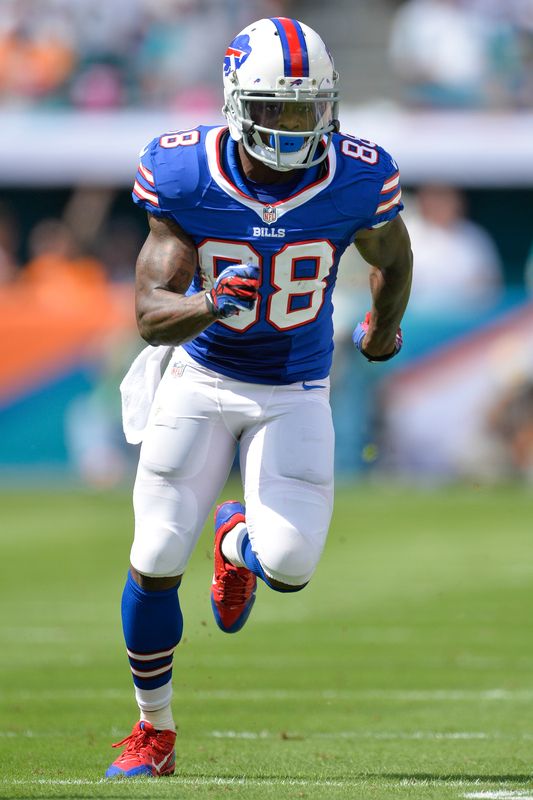 Keep the questions coming on email at AskChris@bills.nfl.net and on Twitter @ChrisBrownBills. I noticed that Jamaal Westerman made the roster, however I know very little about this athlete. Can you you provide a bit of information as to how he made the team. CB: Westerman was a late free agent signee during training camp. The advantage he had was he spent three seasons in Mike Pettine’s defensive scheme with the Jets as a reserve OLB from 2009-2011 after New York signed him as an undrafted rookie out of Rutgers. He split last season between Indianapolis and Arizona, and through his first two weeks here it’s clear he’s got an important role on special teams (39 snaps in 2 games) with a rotational role on defense where to this point he’s been used sparingly. CB: I know there was a detailed piece in the Boston Globe last year by Greg Bedard on the short-worded plays in New England’s offense. Sometimes just one word said it all. The Bills do similarly keep their play calls short for the purpose of moving faster as well. Oftentimes the plays are just three to five words. So your suspicions are correct. I read in two different articles that the new CBA says that if Carpenter is on our active roster on opening day and then we cut him after the Pats game we have to pay him the entire season veteran minimum of $630,000.00. Is that the way the CBA works now? CB: Yes, that’s right, but that’s always been the case even prior to the new CBA in 2011. When a vested veteran player (4 accrued season in the league) is signed prior to the first regular season game so long as he is still on the roster the Saturday before the opener his salary for that season is guaranteed. The Bills were really in a difficult spot due to Hopkins injury. They needed someone to kick and have to bite the bullet on Carpenter’s salary even though he’s unlikely to be here for the whole season. This is why you often see NFL clubs wait until the Tuesday after the season opener to sign veteran free agents they might need to fill a hole on the roster. By signing a veteran player in Week 2 a team is free to release said player without owing him his full season salary. The Bills in this case didn’t have that option. Don’t you think the Bills may get more from the WR position going with Easley and Hogan over Graham and Goodwin ? I think Easley is ready to take the next step and Hogan has a knack for getting open. Goodwin is now injured and Graham has yet to show he can gain separation and make plays. Easley has good speed as well to try and stretch the field. CB: While I don’t disagree with your assessments of Easley and Hogan, I do disagree with your assessment of T.J. Graham. Graham has been open, he just hasn’t been targeted much by E.J. Manuel. In fact on the final drive in the Carolina game alone he was wide open on three plays. What you have to understand is if Graham is not the primary or secondary read, it’s less likely that he’ll be targeted in the passing game. Through two games he’s been targeted a total of four times. We also need to consider the possibility that in an effort to not put too much on Manuel’s plate the offensive staff might only be having him read half the field on certain pass plays so he has only two reads instead of three or four in an effort to avoid sacks by getting the ball out faster. But in watching the game film I can tell you Graham is getting separation and is getting open a good amount of the time. Thank you for the great Bills coverage you provide day in and day out. Question, is tight end Mike Caussin on the Bills Injured Reserve list? I know he was initially waived injured. I don’t see his name listed in the injured reserve section of the Bills Roster on buffalobills.com. I read he had season ending hip surgery on August 21. Any word on how he is doing? CB: Yes, Mike Caussin is on the Bills injured reserve list. He was waived-injured on Aug. 14th and when he was not claimed by another NFL club, he reverts back to Buffalo’s injured reserve list. And that’s where he is at this time. With EJ Manuel and Jeff Tuel splitting reps on Monday it led to some frequent substituting at quarterbacks from one series to the next. The receivers however, claimed they were unaffected by the rotation. Bills WR T.J. Graham participated in practice for the first time on Sunday since suffering a minor groin injury. Graham didn’t do any team work, but intends to increase his workload as the week progresses and told Buffalobills.com that he’ll play Saturday at Washington. “I’m playing in the Redskins game,” Graham told Buffalobills.com. Graham said head coach Doug Marrone informed him that he’d be playing in the team’s third preseason game. He wanted to play last week, but knows in the preseason it’s not worth suffering a setback by pushing to play. Bills WR T.J. Graham is dressed for practice here Sunday morning. Graham had missed a couple of practices and the preseason game Friday night with an injury. We’ll see how extensive his work is in practice as it moves along. Bills WR T.J. Graham was sidelined with a slight groin pull in Monday’s practice and did not participate in practice Tuesday. Head coach Doug Marrone is not taking any chances with the speed receiver as he intends at this point to sit the wideout for Friday’s preseason game against Minnesota. Graham will join Stevie Johnson on the sidelines as non-participants in Friday’s preseason game. Brad Smith is also unlikely to play, which will afford some of the younger receivers more opportunity to play.